Published on 31 July 2012. It’s Annual Review of Competence Progression (ARCP) time for most medical trainees at this time of year. This is where a panel reviews how we’re doing, and how our training is progressing. Most trainees these days have e-portfolios to collect evidence for these annual reviews, but in Public Health in the Northern Deanery, we still use paper… which requires literally hundreds of physical signatures from supervisors, and other numbers from other people, which can make co-ordination something of a challenge! 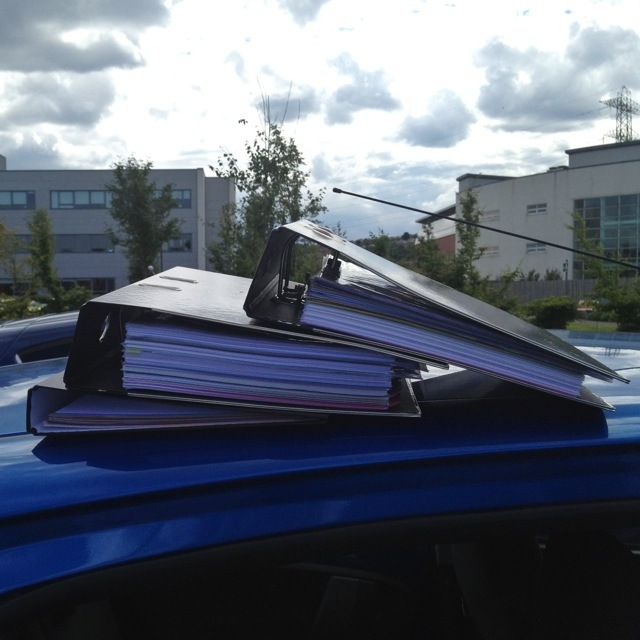 This picture shows my portfolio carefully balanced on top of my car, as I prepared to hand it in to the Deanery’s office. I’m glad to finally have it finished for another year! This 1,747th post was filed under: Health, Photo-a-day 2012, Medicine, Public Health.